The two new Strada F-Class models (confusingly called CN-HX1000D and CN-HW1000D) come with the usual array of gadgets – GPS (of course), DVD and MP3 playback, hard drive, 1-seg mobile digital TV tuner, iPod link and a 7inch Viera screen, but it’s the Bluetooth link that tips the balance. Drivers with a Bluetooth mobile phone can order the sat-nav to dial home to check on what’s happening there. 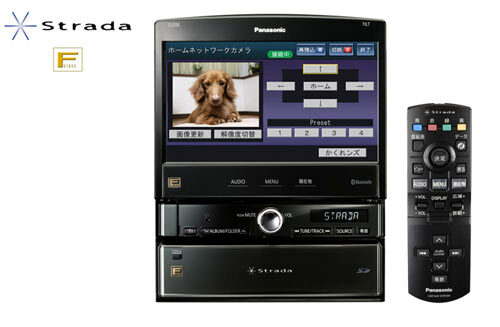 Panasonic calls this the “From Home to Car�? concept, adding breathlessly that it “effectively turns a car into a second living room.�? With a prod of the screen, the Strada can operate domestic appliances, such as lighting and air conditioners, or can tune into webcams around the house (security check, looking in on the dog?). It can even sent instructions to a home video recorder to get started on taping that rerun of Idol. The new Strada models, which differ only in dashboard configuration, are clearly impressive pieces of kit, but do we really need to be ‘always on’ to such an extent? Oh, the price? Each Strada will cost ¥355,000 ($3,500) when it goes on sale in June, with a release outside Japan highly unlikely.